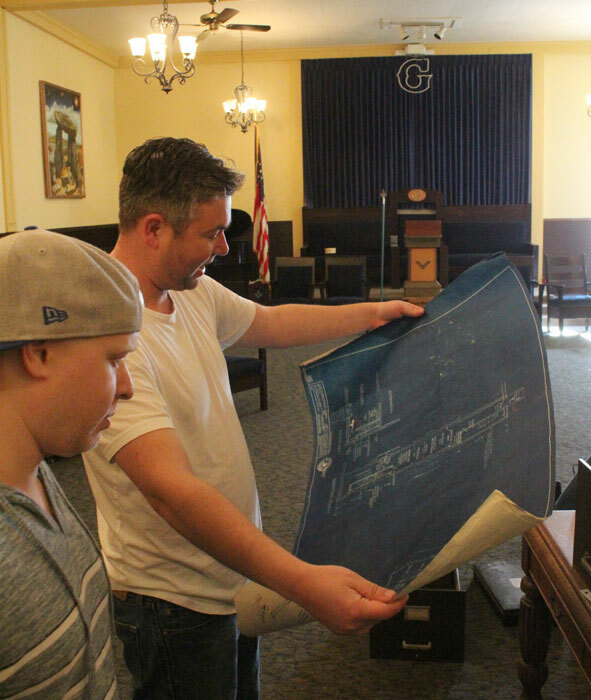 Photos by Brandon Macz: Danny Done, senior warden at the Queen Anne Masonic Lodge, and master of the lodge Andy Goeres look over old blueprints on Saturday, March 30. The lodge building is under contract to sell, the maintenance costs being too high for Lodge No. 242 to cover. Lodge members began removing furniture, historical documents and artifacts from the building on Saturday, March 30. 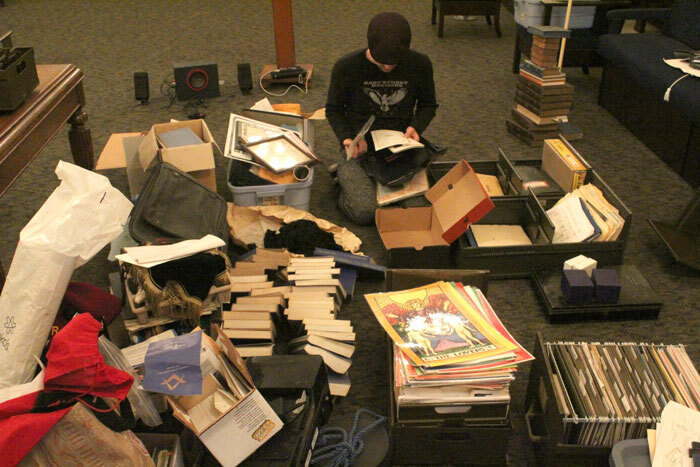 Multiple generations of Freemasons on March 30 began the process of recovering historical records and artifacts from the Queen Anne Masonic Lodge that had served the fraternal organization for nearly a century. 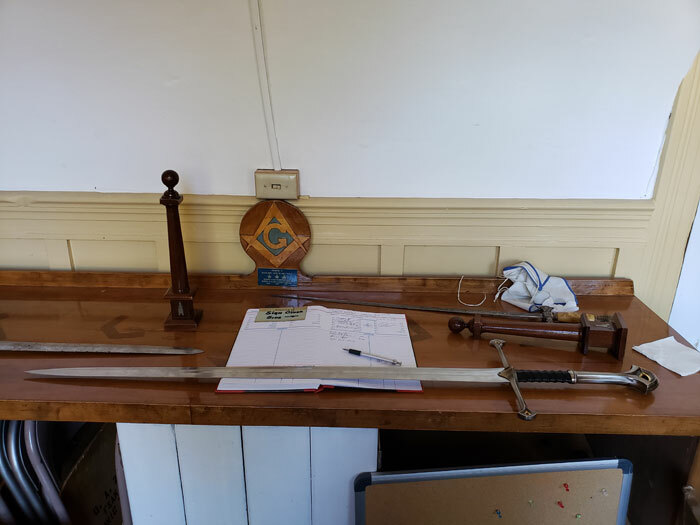 “The finances have always been a problem, keeping the maintenance on things,” said Danny Done, the lodge’s senior warden and a past master of the lodge. The 114-year-old building is in need of a costly seismic retrofit, a new roof and upgrades to its electrical and HVAC systems. But the lodge has long been operated primarily off of donations. 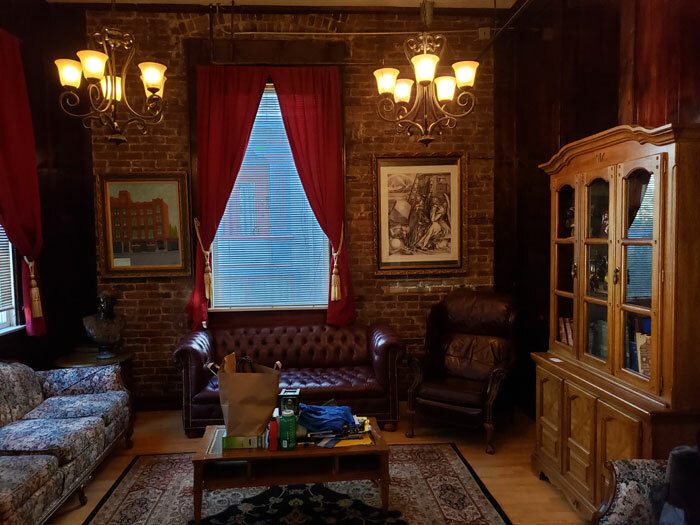 The space had once been available to rent, but its location on a residential street with limited parking and restrictions on noise made it less ideal for large functions, said master of the lodge Andy Goeres, who also serves as secretary of the temple board overseeing the sale of the building. Most of the 40 Lodge No. 242 members are now living out-of-state, and annual dues were just $200. Now the building at 1608 Fourth Ave. W. is under contract to sell, and is planned for redevelopment through a partnership between Queen Anne companies R&R Development and Eiffel Tour. “Our goal is to be able to put two townhomes inside the structure, but that’s all dependent on what happens with the landmarks process,” said Rich Rogers with R&R Development, who stressed the desire to preserve the 114-year-old building.. The Seattle Landmarks Preservation Board will decide whether to accept the nomination, submitted on behalf of the developers by Susan Boyle, BOLA Architecture+Planning, during its meeting 3:30 p.m. Wednesday, April 17, in the Boards & Commissions Room L2-80 in city hall, 400 Fourth Ave.
“The interesting thing is it has a mixed history,” Rogers said. Sunset merged with Portland-based Pacific Telephone & Telegraph Company in 1917, and the Garfield Exchange moved to a newly constructed building down the street, 1529 Fourth Ave. W., in 1921. That building was approved for landmark status in December, and is being redeveloped to include more than 20 new apartment units. The landmarks board found that building was both associated with a significant aspect of cultural, political, or economic heritage and embodied a distinctive visible characteristic of an architectural style, period, or method of construction. Goeres said the masons had made a conscious choice not to pursue historic landmark status previously because of the potential added cost of keeping up the building, but then orders came down from the state that the building needed to be seismically upgraded. “When that mandate came from the state, that’s a pretty big nut to fill,” Goeres said. The question is whether the landmarks board may want to just preserve the front facade, Rogers said, or also preserve portions of the interior. The retrofit requires putting in a “steel rib cage” to reinforce the building. The interior has undergone numerous alterations over the years, on top of its 1924 conversion from a telephone exchange building to masonic lodge. When he was 28, Mathers became the lodge’s youngest worshipful master. Done took that title when he was 26. “My family had been masons for years,” Mathers said. Mathers joined the masons with a friend who’d just returned home from Vietnam, he said. He became lodge master in 1975. Now he attends three different lodges in Snohomish County. He said the goal of the masons has always been to make men better than when they first joined. “I’ve been proud to say I’m a mason,” Mathers said. Done and Goeres joined at the height of the Great Recession, and the lodge proved a great resource for members, a number of whom slept there for a time. While they built membership up early during their time with the lodge, Done said, many younger members became less involved as they turned their focus toward careers and family. As for the ghosts, there are stories within the lodge about past members still residing within its walls. “When guys would stay here, they always said they heard footsteps,” Done said. But a fraternity is about the people, not a place, he said, and the lodge could start meeting again in various venues. “We’re part of this larger community, so we’re not alone,” Done said. 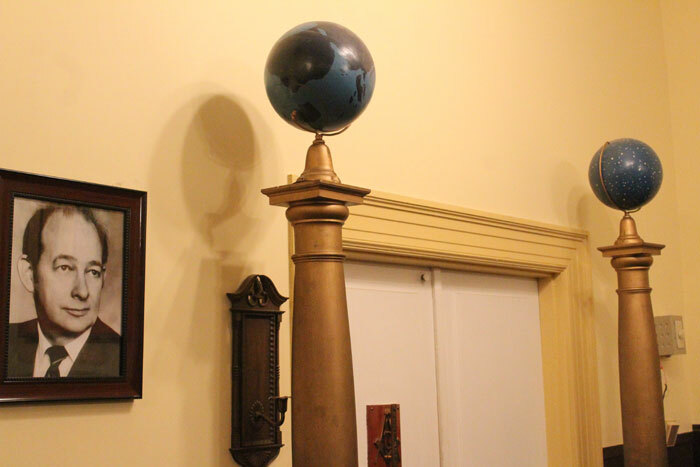 Goeres said the masons plan to continue moving items out of the lodge on weekends, and they expect to retain control of the building through the end of July. Whatever isn’t claimed by members or donated to other lodges in Washington could end up being haggled over at a yard sale, Done said. While it may make fiscal sense to maximize the amount of housing units they can build in the Queen Anne Masonic Lodge building, Rogers said, the development partners want to preserve the nature of the neighborhood. There are six parking stalls already on the site, so there will be no issues with parking should two townhomes be built within the property, Rogers said. If things go as expected with the landmarks board, Rogers said the hope is to have a design plan to the Seattle Department of Construction and Inspections by the end of the year, and to have permits and begin the retrofit in 2020.